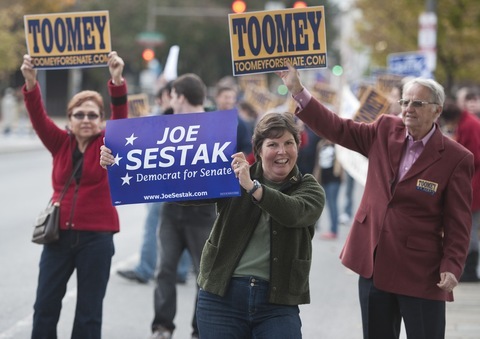 Supporters of Pennsylvania Senate candidates Republican Pat Toomey and Democrat Joe Sestak waves signs before Wednesday’s debate. Photo by Bill Clark/Roll Call via Getty Images. More often than not there’s a natural tightening in competitive political races toward the end of the campaign when undecideds become decideds and partisans come back home for their standard bearer. In critical contests from coast to coast, the Senate landscape appears to be getting tighter. “Meanwhile, Republican challengers, including Dino Rossi in Washington and Carly Fiorina in California, who polls showed had slipped behind two Democratic incumbents, have drawn even,” writes the Wall Street Journal’s Naftali Bendavid. In Pennsylvania, a state which Democrats had feared fallen off their map of potential holds, now seems very much back in play. A Quinnipiac University poll out Thursday morning shows former GOP Rep. Pat Toomey numerically ahead of Democratic Rep. Joe Sestak by two points, 48 percent to 46 percent. That’s well within the margin of error and statistically, a dead heat. In a Sept. 22 Quinnipiac poll, Toomey bested Sestak by seven points, 50 percent to 43 percent. Since then, Democrats in this Democratic-leaning state have consolidated their support around Sestak. And that was no accident. In their first televised debate Wednesday night, Sestak made sure to play up partisan, red meat issues such as abortion to help rally his party faithful. The Democrat lumped his Republican opponent in with Sarah Palin and Christine O’Donnell as on a mission to overturn Roe vs. Wade. Abortion has not been a central aspect in the campaign, but Sestak has been trying to paint Toomey as an “extreme” right wing candidate. For his part, Toomey kept his line of attack on the economy. “Joe has voted for every single bailout,” he said in what has become a constant refrain on the campaign trail. This remains an uphill battle for the Democrats, but it enters the final stretch as a true toss up race, which is something not many observers would have said a couple of weeks ago. Day two of his four-day, five-state campaign swing through the West will find President Obama making stops in Washington and California, two key states in the upcoming midterm elections. At 1:10 p.m. EDT the president will hold a discussion on women and the economy at a Seattle home. Later, he’ll deliver remarks at a rally for Democratic Sen. Patty Murray, who’s locked in a close race with Republican Dino Rossi. Recent polls show Murray with a slim, single-digit lead over Rossi. Then it’s on to San Francisco, where the president will attend an event for District Attorney Kamala Harris, who’s running for California attorney general. President Obama will end the day by speaking at a Democratic National Committee dinner in Palo Alto. Friday, the president will campaign in Los Angeles for Democratic gubernatorial nominee Jerry Brown, who’s running against former eBay chief executive Meg Whitman, and Sen. Barbara Boxer, who faces the former head of Hewlett-Packard, Carly Fiorina, in her re-election bid. From there the president travels to Las Vegas, where he’ll attend a rally in support of Senate Majority Leader Harry Reid and other Nevada Democrats. The trip concludes Saturday with a stop in Minnesota for an event to help former Sen. Mark Dayton, who’s running for governor, and a fundraiser for the Democratic Congressional Campaign Committee. When asked in a pre-trip briefing with reporters if the administration’s strategy of targeting western states like Washington and California was a “firewall” to keep a Democratic majority in the Senate, White House senior advisor David Axelrod called those races “very, very competitive” and said the president’s stops were meant to mobilize and energize voters. The Democratic Congressional Campaign Committee may have started cutting loose candidates it believes are too far behind their Republican challengers to close the gap, but one name you won’t find on that list is Virginia Rep. Tom Perriello. But the DCCC is showing it still has faith in Perriello by releasing a new television ad on his behalf going after his Republican opponent, state Sen. Robert Hurt. The spot seeks to highlight Hurt’s votes for tax and fee increases in the General Assembly and his past opposition to raising the minimum wage. A poll released this week by the Institute for Policy and Opinion Research at Roanoke College showed Hurt with a six-point advantage over Perriello, 46 percent to 40 percent, with 13 percent still undecided. *Editor’s Note: An earlier version of this story stated that Congressman Perriello voted for financial reform. That information was incorrect. This version has been updated.